Just a few weeks ago we were wondering if we’d try to build our own prosthesis if we were ever to lose a limb. This pair of hacks answers that query with a resounding “YES!”. To the right is a replacement pointer finger. The missing digit took the first two knuckles with it, but there’s enough left to easily interface with this creation. It’s a mechanically clever assembly that moves as you would expect the original to. See for yourself after the break. It seem the maker intended to mold silicone around the structure but never got around to posting an update video. On the left we have a chinese man who lost his arms while fishing. It seems they were using homemade bombs instead of nets and one went off prematurely. Since then he’s constructed several different prosthetic arms, each with its own special purpose. This one has a saw connected to it but these two write ups on the man show images of him using a fork and wielding a hammer. Both article indicate that he fished with explosives. So. . . not so clever then? If I had a finger like that, there’s no way in hell I’d shroud such a beauty with a prosthetic skin. I’d love to see some HD pictures of that thing. The mechanical design is amazing. I agree with Max about not covering it up. Wait. How did the man without arms MAKE his prosthetic arms? On another note, this is great, the design is excellent and the range of motion is amazing… I agree with the others, he shouldn’t cover it up with anything, leave it as is, it looks much cooler that way. I noticed the knuckles, but assumed they are another result of the weevil bite done the other damage. Cool looks are worthless, a prosthetic skin could improve functionality by improving some gripping capabilities. Also, I doubt he could actually make some sort of skin for it, with the way it’s constructed, it’d be much wider at the 2nd knuckle due to the range needed for bending the joints. Probably scarring from the same trauma that removed the index finger. Nice work. Reminds me of the old joke about a game warden, and the redneck using dynamite to “fish”. should sponsor this guy in a serious way. …and maybe a fishing gear co,too. Wonder if he could afford the fuel for an Evil Dead chainsaw? should sponser this guy in a serious way. wonder if he could afford the fuel for an Evil Dead style chainsaw? Awesome creation! really slick mechanics. I wonder how much conscious effort it takes to use it. Practice makes perfect of course but there will always be the lack of direct tactile and thermal feedback from the fingertip. I wonder how much that matters when there is still some mechanical/elastic feedback from the tension in the remaining knuckle. 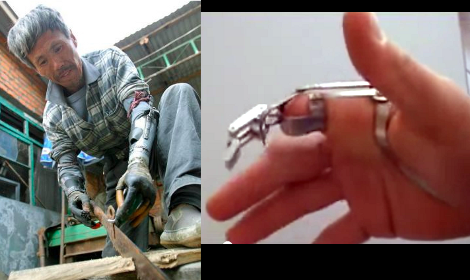 This is really fascinating, and a very impressive bit of prosthetic engineering. Great stuff. I have the exact same amount left of my middle finger. How can I make this or have one made for me? I lost it nearly ten years ago and this would be fantastic. same design as the one in the article, are those mechanical fingers produced by some company? No the fingers posted in the comment are different than the finger in the article. If you look at the comment video you can see blue lights/sensors when he flexes as well as wires/cables on the back of his hand. Perhaps a feedback mechanism of some sort?? The finger in in article looks to be solely mechanical. I take it back, rewatched the video. The back of the hand is mechanical and what I thought were lights are likely a combo of a crappy video and whatever metal they used. made it again!! WOOHOO i am imortal now! I didn’t see any reference to several sets of arms in the articles. My guess would be one set of arm with various ways to connect things to them. Would make a whole lot more sense than multiple sets of arms. Those Chinese arms have to be the most well constructed things to come out of China I’ve seen in a long time, maybe he should give up fishing (blasting) and get into industrial design. I’ve looked at the x-finger design and it looks straight forward but I haven’t seen any documentation that would allow me to build one. I’m missing part of a finger and would love to see a 3d printable version, or even some detailed design drawings. Do you know of any other documentation? Nice hacks, kudos for turning a disability into an ability. Wonder why there aren’t commercial “USB fingers” ™ with pendrives, Bluetooth etc built in so you can remove and attach the end section as needed. Sort of like a socket set. What’s he gonna do, chop his legs off? Wouldn’t stop him. This is awesome. Could this be replicated with 3d printing? I would love to give this to my dad who lost a part of his finger. Tips are welcome :). !